Horizon Beverage VP and general counsel Michael Epstein Jr. said state incentives will be key to Horizon’s big move to Norton. The decision by Horizon Beverage Co. to sell its existing Avon facility and expand into a former General Motors plant was driven largely by state and local tax incentives, not to mention an enthusiastic push by Norton town officials. The wine and liquor wholesaler purchased the 56-acre parcel and 404,353-square-foot building for $20.6 million, and will invest millions more to renovate and expand the site by another 160,000 square feet. The total development cost is expected to hover around $43 million. It’s a heady investment in such turbulent economic times. Then again, it’s unlikely that companies like Horizon will have as many opportunities in the future to buy quality properties on the cheap, a scenario that is in full effect today. The availability of public support was also a plus. To make the deal work, Horizon traded its existing 248,000-square-foot facility to The Davis Cos. for just over $9 million in a sale/lease-back deal that will run three years. 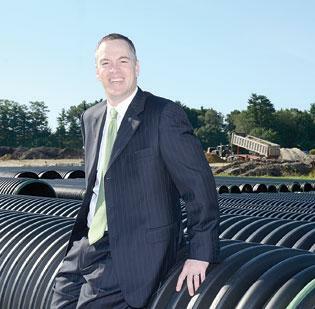 Horizon was in talks with officials in neighboring West Bridgewater for a 500,000-square-foot facility in 2009, but a deal never materialized. Epstein credited Arthur Robert, director of the Massachusetts Office of Business Development, and consultant Lynn Tokarczyk of Business Development Strategies Inc. in Medway, for pulling together a roadmap that ultimately landed the company in Norton. The plan centers around a litany of state incentives to recruit and retain employers. • a $350,000 state investment-tax credit to be utilized over three years. • tax increment financing of $803,532, applicable over 13 years. • $1.7 million in local property-tax exemptions that take affect over 13 years. In return, Norton will generate an estimated $1.7 million in new tax and fee revenue over the deal’s first 13 years. Tokarczyk also estimates the new facility and its 400-plus employees will drive an additional $500,000 in annual spending for local businesses. The development should go a long way to offsetting the recent news that Norton will soon lose one of its largest employers, food marketer and distributor Sysco Corp., as it moves to a new headquarters in Plympton. The new Horizon facility “is not just an expansion, but we’ll be getting better at servicing our customers,” Epstein said. The new facility will feature state-of-the-art equipment and warehouse-management systems, technologies that should boost the accuracy and efficiency of Horizon’s operations, he said. Horizon also owns a smaller warehouse and distribution facility in Ludlow to service the western part of the state, and it leases a similar facility in Rhode Island. Horizon also leases sales offices in New Hampshire, Maine and Vermont.